Lizzy Galliver in History on 31 October, 2015. The Chapter House in Durham Cathedral. Amongst other important commemorations, 2015 has proved a particularly special year in its celebration of the eight-hundredth anniversary of the Magna Carta. Reflecting back across the better part of a millennium, historians, politicians and lawyers alike have engaged in fervent debate about the relevance of this ‘Great Charter’ in the twenty-first century, seen by many as the cornerstone of the British Constitution. In accordance with such discussion, the year so far has witnessed a number of exciting events throughout the country, from the British Library’s ‘Magna Carta: Law, Liberty, Legacy’ to the ‘Magna Carta and the Changing Face of Revolt’ exhibition in our very own Palace Green Library. 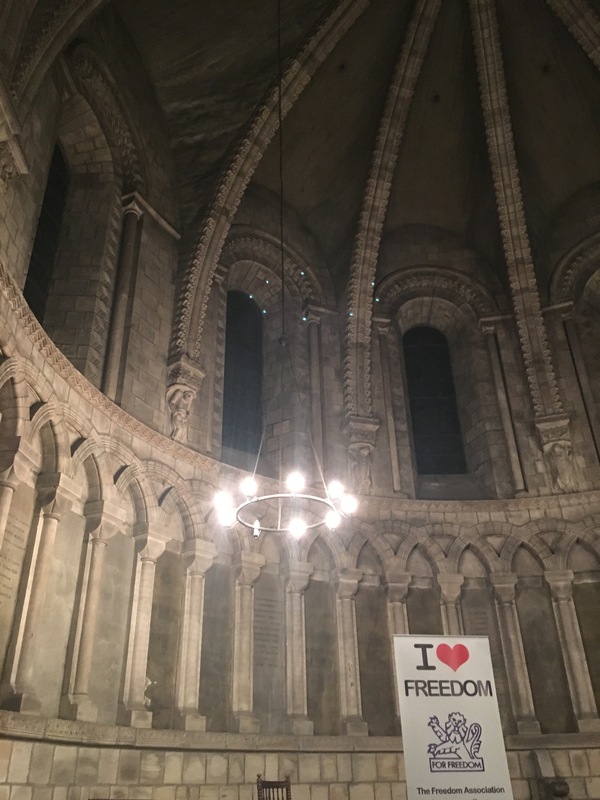 The event was primarily put together by the Freedom Association, a non-partisan (but demonstrably right-wing) British pressure group campaigning for greater personal freedom and responsibility – so one might have thought it’d be obvious in which direction the talk would lead. Indeed, commemorations of the Magna Carta have caused many to link today’s whistle-blowers and activists with the barons, and many hark back to 1215 in their appeal for particular freedoms. Certainly, the debate engaged deeply with these issues, and set a balanced tone on the legacy of the Magna Carta today. Yet while Michael Prestwich, historian and Professor of medieval England, perceptively explained the context around the charter, he ultimately concluded that the barons of the thirteenth century were not freedom fighters, and that the Magna Carta, whilst a progressive piece of legislation by many means, was ‘not a foundation that represents democracy’. In contrast to the many tributes this year praising the document as a ‘rallying cry for modern rights’ and one of the first legislative pieces of democracy, Prestwich’s view was refreshingly honest, realistic and a little bold – especially considering the event rather framed itself as a celebration of the Magna Carta, not a dismissal. While people today seem to hail the idea of thirteenth-century barons as heroically interested in principles of freedoms (rather than simply battles and bread), Professor Prestwich argues that there was nothing to suggest the barons were fighting for liberty. Instead, the charter was a way to move the laws of the land to the King’s Court, limit abuses of feudalism (primarily wardship), and curb the excessive power of the monarch. Essentially, he analogises, it was the ‘medieval equivalent of a nuclear deterrent’. But even then, we’re told, the impetus and force behind 39 (together with 38 and 40 – the so-called ‘Golden Passages’) came more from Pope Innocent III and his papal legate than from the barons themselves. Moreover, the variety of clauses shouldn’t be exaggerated. Women, for example, were hardly mentioned at all, and the majority of the terms agreed only affected a very limited number of the population. In October of 1215 the English Civil War broke out, and King John was quickly deposed. Under John, the charter in itself was a failure. Six weeks after oaths were taken, the Pope (seemingly reversing his resolute opposition to the King) issued a papal annulment of the document and excommunicated the barons involved, hence triggering the war. After John’s death, however, the charter proceeded to hold more weight, especially under Henry III. An amended version appeared in 1225, which, aside from a few slight revisions, is the version we can view today. While the original charter set the framework for a balance of power between the monarch and his subjects throughout much of early modern England, Professor Prestwich seems fairly set that the importance of the Magna Carta today has been widely overstated. The fact he tells us that canoeists find the document of continual importance today (something about a right to waterways…) is rather revealing about his own opinion on its far-reaching significance. In terms of practical application, only three clauses remain in statute – and they’ve only been used around a hundred times in the last century. As Helen Fenwick, Professor of Law and Global Justice at Durham University and director of the Human Rights Centre, goes on to discuss, the underlying values of the Magna Carta have a certain significance in contemporary legal debates about principles of freedom. She argues that although the 1215 document didn’t guarantee freedom of speech at the time, and although the clauses were often too general to be of use in law courts, it has been credited with founding the conditions for human and civil rights in and outside of Britain. This is particularly pertinent in an age of counter-terrorism, she suggests, when the lines between freedom of speech and inciting/glorifying terrorism (especially online) seem to often be found blurred. Indeed, the Magna Carta holds a lot of symbolic weight, even if its official constitutional standing remains somewhat irrelevant today. Its fundamental principles of law and justice have supported the basis of many human rights’ constitutional documents over the centuries, including the United States Bill of Rights (1791), the Universal Declaration of Human Rights (1948) and the European Convention on Human Rights (1950). Professor Prestwich astutely makes a case that it is the myth of the Magna Carta that we should be thinking about. The barons might have seen the document as a means of addressing only small, personal liberties, but their descendants did not. The key lies in what later generations claimed or believed it said – in terms of liberty, democracy, and freedom of speech – and how this has been translated in the modern world. It is for this reason that we should commemorate the Magna Carta today.